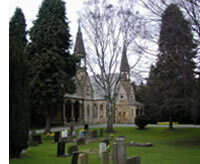 In 1999 we reported that the Non-conformist and Anglican chapels at the entrance to Ilkley Cemetery were no longer required for conducting funeral services. Both chapels are listed Grade II and date from the 1880’s, being built in sandstone and gritstone in a simplified Gothic style with some Romanesque detailing. The Trust ought the chapels from Bradford Council at a peppercorn rent and a scheme has been devised to lay on water and other services and make repairs to both buildings. New uses for both chapels must also be appropriate to their location in the cemetery. The South Chapel is being leased as an archive and money from this combined with other grants and funding from the Trust will enable restoration works on both chapels. Listed Building Consent has been granted for the necessary repair works to both chapels and a tender has been accepted. However, bats are roosting in both chapels! Bats are protected by law so an expert has been brought in to advise on the best approach. Two species have been identified, Daubenton's bat and the Brown long-eared bat. Please see the paragraph on Heritage Open Day for a chance to view the chapels. Ilkley Civic Society and Bradford Building Preservation Trust are working jointly to find a more suitable setting for the many gravestones that used to surround All Saints Parish Church. At present they are stacked in a corner of Ilkley Cemetery. Permission to carry out the scheme has been sought from Bradford MDC’s Cemeteries officer and local organisations have also been asked to write letters of support. It will be necessary to prepare a bid for grant aid to undertake the delicate task of moving the stones to a more fitting resting place around the two cemetery chapels and it is hoped that the work will begin after the refurbishment work to the two chapels is completed. There has been for some time concern over the condition and future of this small but important Georgian Bath House which has been falling into disrepair. White Wells was Britain’s first hydropathic spa and in 1859, during the publication of his book 'Origin of the Species’, Charles Darwin came to the Wells in order to take the waters. A public meeting was recently held in Ilkley Town Hall on the future of White Wells and Bradford Council are continuing to repair and preserve this unique historic building for future generations to enjoy. BBPT has offered the Civic Society help and advice where needed. Derek O’Hearne and Steve Bateman of the BBPT were recently invited to address the Civic Society on this matter and have been made honorary members of the Society. It is hoped that it will not be too long before visitors to the White Wells can see it fully restored.